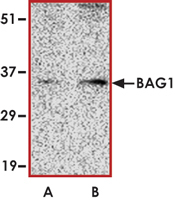 Sample Data :Western blot analysis of BAG1 in PC-3 cell lysate with BAG1 antibody at (A) 1 and (B) 2 ug/ml. Scientific Background :BAG1 (also known as BCL2-associated athanogene) is a membrane protein rich in glutamic acid residues that binds to BCL2 and blocks apoptosis or programmed cell death (1). The BAG1-BCL2 complex enhances the anti-apoptotic effects of BCL2 and represents a link between growth factor receptors and anti-apoptotic mechanisms (2). 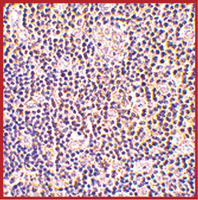 Overexpression of BAG1 in 3T3 fibroblasts prevents apoptosis in the presence of low serum. BAG1 has also been shown to interact with activated glucocorticoid, androgen, estrogen and progesterone receptors. Binding to these receptors by BAG1 is dependent on receptor activation. 1. Tang, S.C. BAG-1, an anti-apoptotic tumour marker.". IUBMB Life, 2003; 53 (2): 99–105. 2. Clemo, N.K. et al: The role of the retinoblastoma protein (Rb) in the nuclear localization of BAG-1: implications for colorectal tumour cell survival.". Biochem. Soc. Trans.2005; 33 (Pt 4): 676–8.